All EAM software — a subcategory of CMMS software — offer asset management, but some stand out from the crowd for this crucial feature. 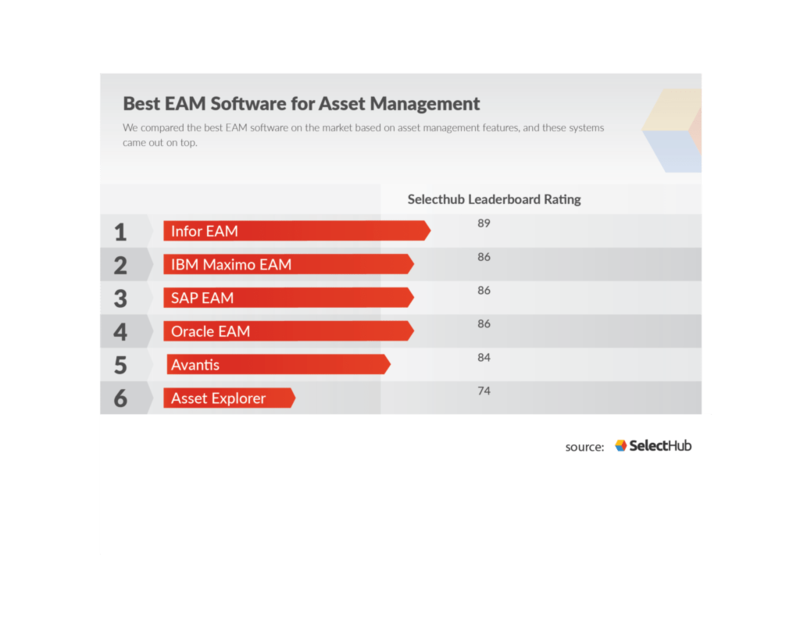 Here are the best EAM vendors for both fixed and IT asset management. Infor EAM is one of the most configurable enterprise-grade asset management solutions on the market. It provides comprehensive asset management features within the EAM solution to improve capital asset management. It aims to increase reliability, enhance predictive maintenance, ensure regulatory compliance, reduce energy usage and support sustainability initiatives. Available in industry-specific editions, it gives users unparalleled flexibility to zero in on the specialized industry requirements that can turn a company’s asset management into a competitive advantage. More than just computerized maintenance management software (CMMS), Infor’s enterprise asset management and maintenance solution enables companies to improve performance visibility by analyzing data for key trends and anomalies, forecasting reliability issues, and making forward-looking decisions that deliver improved bottom-line results. This solution from Infor offers full functionality for ALM and provides monitoring, tracking and analytical features. 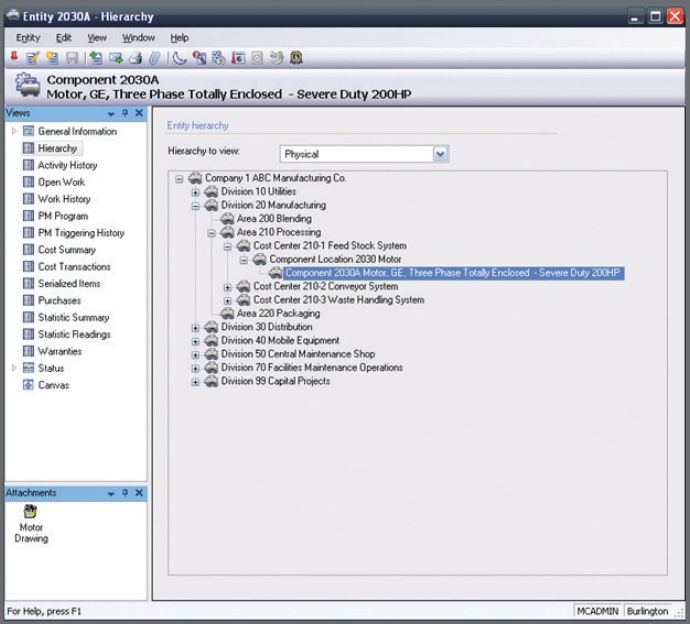 It allows users to view asset movement by creating a family tree that shows the relationships between equipment, parts, components and their location. Infor’s EAM system helps consolidate asset information related to cost, depreciation, warranties, claims, etc. to help optimize asset life. 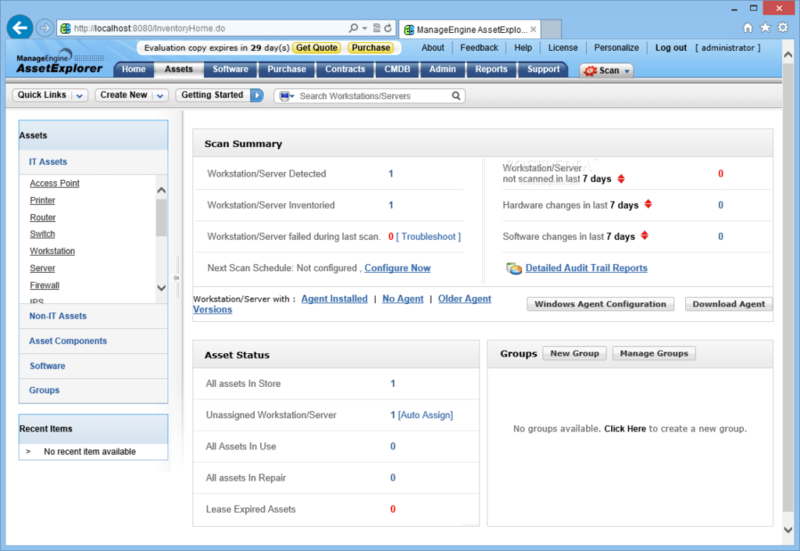 This EAM application can be deployed on-premise, in the cloud or as a hybrid solution. Infor EAM is an overall strong solution that provides built-in tools for in-depth asset profiling to mitigate risks and ensure regulatory compliance. It also allows users to assign barcodes and labels to the assets to streamline asset tracking, warranty activation, etc. IBM Maximo Asset Management is a comprehensive solution for managing physical assets on a common platform in asset-intensive industries. It offers built-in mobile access, out-of-the-box mapping, crew management and analytical insight. In addition to meeting the requirements for manufacturing and facilities with core Maximo, IBM has developed specific industry solutions for key asset-intensive industries. With Maximo, you can maintain all asset types, check their health in real time and streamline global operations, from procurement to contract management – on premises or in the cloud. This EAM software provides 360-degree asset tracking functionality. Asset management is the core module within Maximo. It provides a centralized information system to track asset movements, failure and performance across the enterprise. IBM Maximo allows users to create workflows and manage asset performance throughout its lifecycle to ensure regulatory compliance. Users can also create a template for custom report generation with IBM Maximo. This system helps users schedule maintenance activities and provides reports on shutdowns, outages and turnarounds, improving response times to faults to increase operational efficiency. IBM Maximo also keeps track of production, IT, facilities, etc. It allows users to develop programs for preventive and predictive maintenance, increase asset uptime and reduce unplanned maintenance. This solution allows users to create asset hierarchies, assign attributes and build and manage warranties. IBM Maximo EAM can be deployed in the cloud or on-premise. SAP EAM provides powerful asset management functionality with a wide spectrum of features for business processes from asset purchase to disposal. With SAP EAM, users can build a solid, standards-based foundation for managing their physical assets – whether your business relies on production equipment, power grids, machinery, vehicles or facilities. SAP’s enterprise asset management software can help you increase operational efficiencies, improve asset usage, reduce costs and better manage capital expenditures throughout the asset lifecycle. It can be deployed either on-premise or as a web-based solution. With SAP, users can streamline asset management for your property, plant, and equipment assets. This enterprise asset management software integrates with ERP and operational technology systems – and supports preventative maintenance, asset utilization, remote monitoring, real-time analytics, and more. Extend the life of your equipment and maximize uptime with SAP’s maintenance planning and scheduling software. With real-time analytics tools that tap the Internet of Things (IoT), you can analyze sensor data and information in your CRM, enterprise resource planning (ERP), and asset systems – and create automated work orders to improve field service and cut costs. This solution provides a holistic view of performance, risk and costs throughout the asset lifecycle with information related to usage of assets, accounting costs, warranties, etc. This allows users to keep on top of increasing asset ROI and and make informed purchase decisions. SAP EAM also provides strong maintenance management functionality. The solution consists of asset management and work order management tools and ensures regulatory compliance. It helps keep assets at their peak performance by implementing timelier maintenance and shorter response times. SAP lets users create templates for work processes through Work Clearance Management integration. You can also create a fault tree list against a part or equipment in the asset master list. Oracle delivers asset maintenance software that helps users drive strategic asset planning initiatives. With a complete view of all types of assets and equipment, you’ll know where a particular asset is in its lifecycle and whether it is providing value to your business. Oracle’s maintenance management solutions, part of Oracle SCM, enable you to extend the life of your assets and reduce equipment breakdowns by intelligently forecasting needed maintenance. Oracle Enterprise Asset Management supports sophisticated, condition-based maintenance strategies for property, plants and public infrastructure. Oracle can be deployed via the cloud or on-premise. Oracle EAM’s single-instance design ensures best practices and quality compliance globally and works to help users eliminates obsolete spare parts inventories. The solution also smooths coordination of maintenance schedules to improve both the responsiveness and accuracy of contracted maintenance through convenient workflow management features. The system provides comprehensive fixed asset lifecycle management functionality. This platform integrates with Oracle SRM, financials and project management. The solution integrates full visibility into asset hierarchy and assigns a parts list for each asset. It allows users to track the location and movement of physical assets and helps check assets for any faults, view performance based on warranties, depreciation, etc. This EAM solution also helps monitor asset transactions related to work orders and maintenance. Oracle also offers a robust maintenance management module that supports a spectrum of requirements including materials, cost, work execution, scheduling functionality and template creation. It allows users to create templates for work orders and keep track of asset availability statistics such as quantity, market value, location and maintenance history to ensure safety. It also has assistance to help users adhere to regulatory compliance. Avantis Enterprise Asset Management (EAM) by Schneider Electric is an enterprise asset and maintenance management solution designed for midsize and enterprise companies. It is a comprehensive solution for providing maintenance management, spares, and inventory management, and provides complete procurement capabilities for asset intensive industries. Users can increase asset availability by seeing that necessary maintenance is performed and enable maximum output from expensive and complex assets. The unique Rapid Implementation Methodology (InRIM) from Avantis, based on predefined business processes and best practices, minimizes employee time investment and reduces your implementation risk. With increased visibility into maintenance history, inventory, and procurement, you can implement a preventative maintenance program that maximises return on asset investment. Avantis delivers a comprehensive enterprise asset performance management solution. At its core is maintenance repair and operations, spares and inventory management, and procurement. These are augmented with condition management solutions for actionable predictive maintenance and role-based decision support. The Schneider Avantis Suite allows users to create a hierarchical relationship between assets and its subparts and components. The solution allows users to track and monitor asset utilization, performance and costs incurred through its lifecycle and create warranty records with advanced preventive and predictive maintenance tools. Avantis supports excellent maintenance management capabilities through integrated predictive analytics software, Avantis PRiSM. This solution lets users run programs for preventive, predictive and condition-based maintenance. Avantis supports both on-premise and web-based deployment options. This EAM platform also helps optimize asset life and utilization by reducing downtime and related costs, improving environmental health and safety and regulatory compliance. The solution also enables users to collect and analyze critical asset data for easy asset monitoring. ManageEngine AssetExplorer is a robust IT asset management module that’s part of a larger overall IT helpdesk solution from ManageEngine. Ideal for large corporations, AssetExplorer offers a detailed solution to manage all types of assets across locations and offices. Users can feel confident in managing software licenses and understanding software license compliance with Asset Explorer. Getting information on any unauthorized software in the organization helps asset managers act proactively to curb illegal usage and problems associated with it. This EAM application supports only cloud-based deployment. ManageEngine Asset Explorer helps meet regulatory compliance by supplying regular notifications and alerts for software licenses, authorization, purchases, etc. and allows maintenance of workstations for troubleshooting and other faults. ManageEngine Asset Explorer is able to scan a network and discover all software available in each workstation. It can be used to manage workstation or network devices like Windows, Linux or Mac in a domain or network. ManageEngine Asset Explorer easily manages all license types like OEM, concurrent, enterprise, free, named user, node locked, etc. ManageEngine Asset Explorer provides excellent IT asset management functionality and provides enterprise-wide visibility into both IT and non-IT assets. It allows users to create product types and create lists under parent categories to build group lists. This EAM solution lets users record, track and manage both software and hardware assets, and provides useful insights into their performance, purchase, contracts and costs. The platform also allows users to manage warranty information related to the expiration of an asset’s software license or renewal. So Get to Work — Smarter! Hopefully that brief overview gave you a better idea of which vendors to include in your shortlist for EAM software with asset management capabilities. Some will be a better match depending on your business size, budget and other needs, so check out our full CMMS comparison matrix to get an in-depth comparison of the options. Are there EAM systems not included that you think deserve a place in the best of the best? Leave us a comment and tell us why!